Senlin Ascends is the first book in the series, “The Books of Babel.” Thomas Senlin and his wife Marya are on their honeymoon. Senlin is headmaster of the school in a small fishing village. He has long studied and taught about the most amazing technological achievement in the world: the Tower of Babel. Newly married, the couple decides to spend their honeymoon visiting this marvel. Almost immediately after arriving, they are separated and Marya becomes lost. It takes Thomas a couple of days to realize this. By the time he does, the trail has gone cold and his only hope is that Marya has successfully made it to their intended destination on the third floor of the tower. Thomas embarks on a journey into the tower. There he finds that nothing is as it seems, no one is who they say they are, and everything he thought he knew about the tower was wrong. Senlin Ascends is set in a dark dystopian world. The tower is a technological marvel, still under construction after 1,000 years. Most of the world has very limited access to technology. Marya and Thomas travel to the tower via steam engine train, and later we see Thomas’s amazement when he encounters electricity for the first time. The tower has access to more advanced technologies, but Thomas finds the rules governing behavior and organization in the tower are unique and often must be discovered by breaking them. Failure to follow the rules can have severe consequences. Failure to know the rules is irrelevant. After spending several days surmounting the obstacles that face travelers on levels one and two of the tower, Senlin finds his first clue that Marya is still alive when he is on level three. Level three, though, is also where he begins to appreciate just how much trouble she–and really, both of them–are in. Their short honeymoon journey is going to be a trial of many months, and there are many challenging enemies who oppose them finding each other. And a mild-mannered intellectual headmaster is ill-equipped to meet the challenges of a world that doesn’t make sense. If Thomas Senlin is to find his beautiful bride, he will have to become something he never expected: a hero. The two journeys of Senlin Ascends are both fascinating. The physical journey through the tower is vividly imagined. Each floor has its own culture, its own set of rules, its own internal logic that must be mastered before one can proceed. There are no shortcuts. Failure to follow the rules means banishment from the tower…or worse. But the rules change on each floor, the people in charge owe nothing to anyone else, and following the rules can require compromising your own ethics. Senlin finds that the price of success, the price of moving forward, the price of finding Marya, gets higher the further he goes. But he has no choice if he hopes to be reunited with his love. The physical journey requires a hero’s journey for the protagonist. Thomas Senlin thinks he knows who he is. Intellectual. Calm. Reserved. A man of peace. The kind of man the tower destroys and spits out before passing the first floor. Senlin discovers that he can become more, but he also discovers that the price is high. The man of peace must seek out confrontation. The loyal husband must walk away from friends. The man who understands the world must understand that he knows nothing about this world. These are not easy transitions, and one suspects that the man who eventually finds Marya inside the tower will not be the same man who lost her outside those walls. The second book in this series is Arm of the Sphinx. The third book, The Hod King, is due out in early 2019. 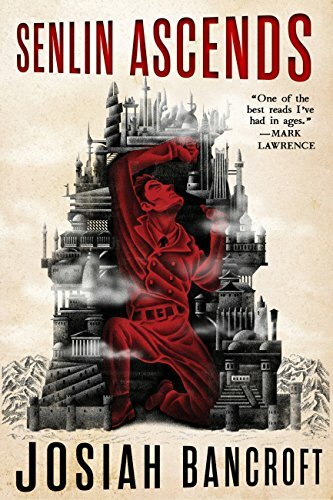 Josiah Bancroft has started an interesting fable with Senlin Ascends, and I look forward to reading the subsequent adventures set in this curious and dark world.